Depeche View loads all text files from a .zip, .tar.gz, .tar.bz2 or .jar file, showing them all in a single window, as if they were one large text. The tool can even view nested archives within archives, e.g. a .jar file embedded within a .zip file. This makes it extremely helpful for programmers who need to get a quick overview in downloaded Open Source packages, to check if they contain a solution for a specific technical issue. But of course it is also helpful for anyone who wants to check quickly the contents of some archive file, either downloaded from the web, or on hard disk. I need example source code on how to write a video player. I go to sourceforge.net and search for "video player". I get a list with 300 results. There is an "Open Video Player", presenting a download button "ovp-sl-2.3.1-src.zip". That means the presented file contains source code in a .zip package, so let's try. I click on that button. 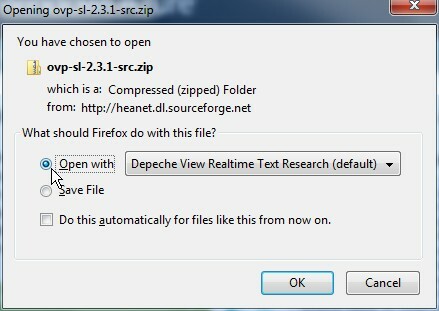 Because I registered Depeche View to handle .zip file extensions, Firefox asks me "download or open with Depeche View"? And I click on "Open". The file is downloaded and opened in Depeche View Pro immediately, presenting 319 text files. Clicking the Filter button gives me the list of filenames. Unfortunately, the project does not use C++, but ".cs" files, meaning Microsoft Visual C# code. But I want a C++ or C example, so I press Escape and ignore that package. Depeche View saved me lots of time, as I didn't have to extract the package at all. back into the SourceForge result list. I see "xine-lib-1.1.19.tar.bz2". Let's try that. As Depeche View comes up, the file list says: it's C source code! so I type "int main" and click on the button, to find main programs that can be taken as a research starting point. 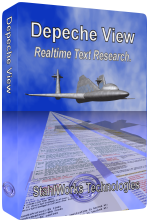 Download the free Depeche View Pro Demo which can be used for 30 days. Run the tool as Administrator, to allow registering of file extensions. Click on the Setup button, and check all under "Register Depeche View In Windows Explorer", as shown to the right. Close Setup, exit the program by Escape. The next time that you click on a .zip or .tar.bz2 link within Firefox, you will be asked to open it with Depeche View directly. 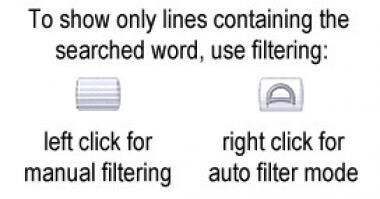 One further tip: when searching stuff in a .zip file, use the Filter button (square F at the right bottom) intensely, as it gives you either a list of text lines containing only the searched word, or the whole file list. Even better, right click on that button to activate Auto Filter Mode (it then becomes a square A button). More about it in the tool's help under "Filtered Views". step4 next source code package, searching "int main". registering DView to open .zip files directly.